When was the last time you’ve texted someone on WhatsApp or Facebook Messenger? I bet you keep at least three WhatsApp conversations going right now. While reading this article. These days, we can’t imagine our lives without messengers. It allows us to have real-time conversations and multitask, all at the same time. Which brings us to live chat as a business tool. It’s been said a lot about live chat and its advantages over the years – how people prefer it over all the other customer service channels, how it increases loyalty, conversions and how it can pretty much bring us all the world peace. But what are the actual facts? Is live chat really that awesome? Short answer? Yes, live chat is really THAT awesome. Long answer? 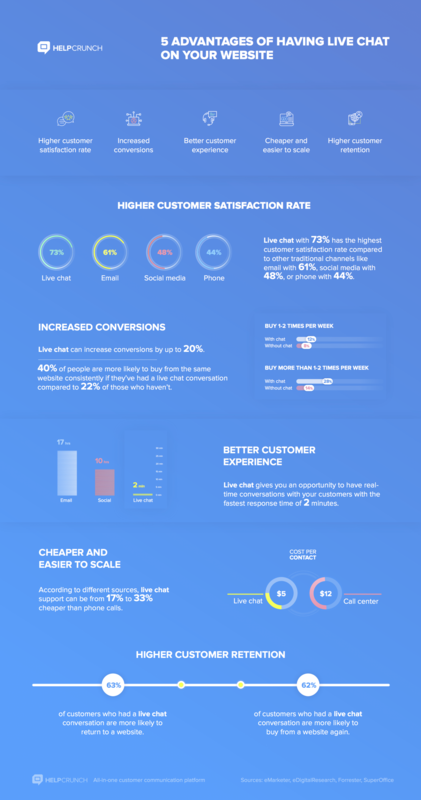 We’ve collected 5 main advantages that a business can get from having live chat on a website and present them to you in the following infographic. Every word in it is backed by data and common sense. Not for nothing, live chat is just a great way for communicating with your customers. They don’t want to wait on hold no more (if they ever even did), they want to get their issues resolved fast and efficiently. The new era of customer communications is upon us. Are you ready for it?